YA books are a booming business. Each of the Big Five seems to have at least one imprint with a large list of YA titles, and it looks like everyone wants in on the action. I stumbled across a Publishers Weekly article, "Smells Like Teen Imprint," which lists 15 new YA imprints launched within the last five years. Sadly, Strange Chemistry isn't among them. The good news is, more imprints should mean more choices for YA readers, right? Granted, YA-specific imprints aren't the only ones publishing good YA. The first example to come to mind is Mary Weber's Storm Siren from Thomas Nelson (which I heard entered its second printing!). Still, the majority of YA books come from imprints that focus on YA, so I'm focusing on those for now. I couldn't find any complete lists of all the YA imprints out there, but there's a 2012 post on The YA Curator that lists imprints for the Big Six (now Five), mid-sized and small presses (which may be a little out of date). I haven't gotten around to sorting my books into publisher lists on Goodreads, so I have no idea which YA imprints repeatedly publish books I like or which have resulted in multiple 1-star reviews. Some of you may be organized like that; some may not. So, my question: are there any YA imprints with whose books you've had lots of success? The opposite? Any imprints whose books you avoid? Or are there any new imprints whose books you'd like to check out? Interested to see where this goes, obviously I am not the best source as I read so little YA. I did like a few that Strange Chemistry put out though, may miss them. I have never thought of organizing my Goodreads by publisher! This is an interesting idea however. If I go through and categorize just my YA shelf, I wonder if any commonalities would appear. I bet I dont read enough YA yet to truly see successes or failures. I've checked my physical bookshelf, and for the Big 6, nearly half my books are Harper Collins (HarperTeen, Katherine Tegen). 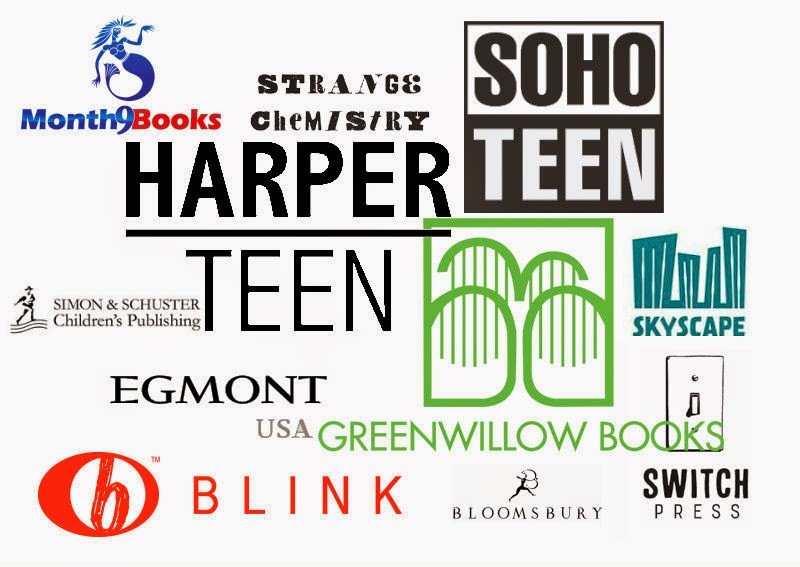 Another third is made up of Hachette, Penguin, Macmillan, Simon & Schuster and Macmillan teen imprints. For some reason I barely have any Random House books on my shelves. The few remaining are Harlequin Teen, EgmontUSA and Disney Hyperion. My Goodreads shelf is much more balanced, and also includes EntangledTeen and a few smaller presses. That's awesome; I think HarperCollins/HarperTeen takes up most of my bookshelf, too, actually, with Random House and Penguin coming in close at its heels. Chicken House and Philomel have published some of my favorite authors, so I have quite a few of them as well. I've only recently started noticing who published what books I read, and generally who published it doesn't factor in to whether or not I'll read a book. I do have my favorite publishing houses, naturally, based on what authors they've published. I don't have a list - but I have a general feel in general based on the first few years of reviewing. I have a few publishers that I favor because I have had consistently more enjoyment from their books. I think with reading as much as we do you start to notice you will favor some publishers over others - probably because the editors or acquiring agents that pick up/contract the books have a taste that coincides or suits yours. Which of course isn't always reliable so I still try to keep track of most of the books that will release in the genres I like. But hey that makes for a long list of catalogs to keep track of!